Officials say one resigned and the other is suspended after patient in vegetative state gives birth to baby. 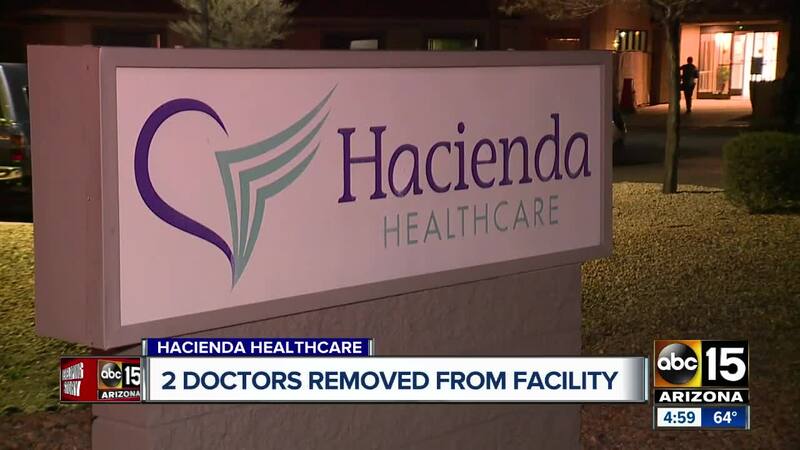 Two Hacienda Healthcare physicians who were responsible for providing care to the sexual assault victim are no longer providing medical services to patients, according to a statement issued by the facility. The announcement comes one week after a former Maricopa County attorney was selected by the Board of Directors to lead an internal review. Former Maricopa County Attorney Rick Romley said his investigation will focus on patient-security procedures and management practices to ensure patients don't suffer harm in the future. "They gave me assurances that they wanted to not just find out what happened, but they (also) wanted to correct the situation," he said. "The two physicians who were responsible for the care of the sexual assault victim are no longer providing medical services to Hacienda patients. One has resigned. The second doctor has been suspended. Once again, we offer an apology and send our deepest sympathy to the client and her family. Hacienda intends to do everything possible to restore its credibility in the eyes of our patients, families, the community and our agency partners at every level." The 29-year-old victim has been in Hacienda's care since she became incapacitated at age three after suffering a near-drowning. She gave birth Dec. 29. The child will be taken in by the mother's family. A nurse who cared for the victim during her delivery said in a 911 call that she was unaware that the patient was pregnant . Investigators are gathering DNA from all men who worked at the facility.